It's not difficult to judge quality in wood furniture and you don't need to be an expert to do it. All you need to do is look at the material, construction, and finish and take your time. It can also help to become familiar with some wood furniture terms. Furniture is made of different woods classified as hard, soft, or engineered. The kind of wood that is used is one of the factors that determine how long your furniture will last and how it will fare with age. Quality furniture is generally made out of hardwood which comes from deciduous trees like oak, maple, mahogany, teak, walnut, cherry, and birch. The wood will have been air-dried then kiln-dried to remove all the moisture. Coniferous trees such as pine, fir, redwood, and cedar produce softwood. It's possible to find good quality furniture in these woods, but they require more care because they're more prone to scratches and dents. Solid wood furniture is largely a thing of the past. You can still find it, but it's more common to find furniture constructed from plywood or engineered wood. You shouldn't necessarily dismiss this material as second-rate because it provides strength and prevents splitting or warping. It can make for sturdy, long-lasting and highly attractive furniture when it's used with high-quality veneers. The way a piece is constructed can contribute to its beauty, functionality and how long it will last. The joinery and sturdiness of a piece will tell you a lot about its quality. Mortise and tenon and dovetails are two of the oldest ways of putting furniture together, and they make for the strongest and most visually appealing joints. Good joints can also have dowels or screws, but they'll never be stapled. Any glue that's used won't show outside the joint. Look for corner blocks that add to the strength and stability to a piece. These aren't visible from the outside. They bolt to both sides of the interior corners. A good quality desk or chest of drawers may have dust panels or thin sheets of wood between the drawers in the body of the piece. This not only makes them stronger structurally, but it keeps dust away from clothing or papers. Back panels that face the wall are generally attached with screws to help ensure lateral stability. Backs and unexposed parts should be sanded smooth and well fitted. This is an important feature, as only well-constructed furniture has these details. 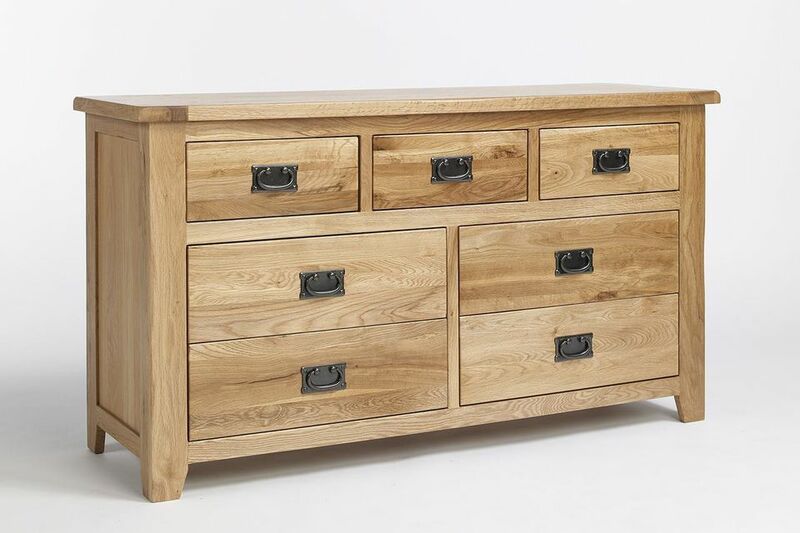 Drawers should fit well and have glides to allow you to effortlessly move a drawer in and out of its station. They should also have stops to prevent a drawer from being pulled out or falling. Glides in office furniture such as desks, file cabinets, and computer armoires are important to the functionality of the piece. Doors should close neatly and be flush with the cabinet front, and the hardware should be of good quality. Test for sturdiness by trying to rock or jostle the piece. It shouldn't squeak, twist or wobble. Check to make sure it's level with the floor. Sanding, staining, and finishing are part of the process, and neglect at any of these stages can affect the overall quality of a piece. Sanding is the first step in the finishing process. A good piece will be smooth so there are no rough patches when you run your hand over it. Sanding across the wood grain will produce unattractive results, such as dark lines or scratches across the surface. Improperly sanded wood will not take the stain evenly. Inspect the finish from different angles to check for blotchiness or scratches. A good stain enhances the natural beauty of wood and adds color and character. It can make one wood type look like another, or make different woods look similar. High-quality staining will be even without any dark spots. All sides and the ends should be the same tone. Finishes range from high-gloss to matte. A high-quality finish is satiny smooth and free of rough spots, dust specks or bubbles. Look for depth and richness in the finish, which comes from several light coats of finish with sanding between the coats. A high-quality piece is finished on the back and on the underside as well to reduce the chances of swelling or shrinking. Distressed furniture is an exception to all of the above. You'll find that the surface uses many of these effects to age new furniture and to heighten its rustic appeal. The wood is beaten, battered and nicked before applying the finish. However, good quality distressed furniture should still be well constructed and sturdy.